HMS Chatham was a Town-class light cruiser of the Royal Navy launched on 9 November 1911 from Chatham Dockyard. She was the lead ship of the Chatham subgroup. She was initially assigned to the 2nd Light Cruiser Squadron in the Mediterranean, where she participated in the pursuit of the German ships Goeben and Breslau, but in 1914 was detached to operated in the Red Sea. In November that year Chatham (Captain Sidney R. Drury-Lowe) was involved in operations against the German commerce raider SMS Königsberg. In May 1915 she returned to the Mediterranean to operate in the Dardanelles to support the allied landings at Gallipoli. She oversaw the landings at Suvla Bay, where she was the flagship of Rear-Admiral John de Robeck who commanded the landing fleet. In 1916 she returned to home waters and joined the 3rd Light Cruiser Squadron of the Grand Fleet. On 26 May 1916, Chatham struck a mine and had to be repaired. After the war, Chatham was lent to the Royal New Zealand Navy from 1920 to 1924, and was sold for scrapping on 13 July 1926 to Ward, of Pembroke Dock. In 1922, the crew of the Chatham donated a cup to the New Zealand Football Association. This became the Chatham Cup, New Zealand's local equivalent of the FA Cup, and its premier knockout football trophy. 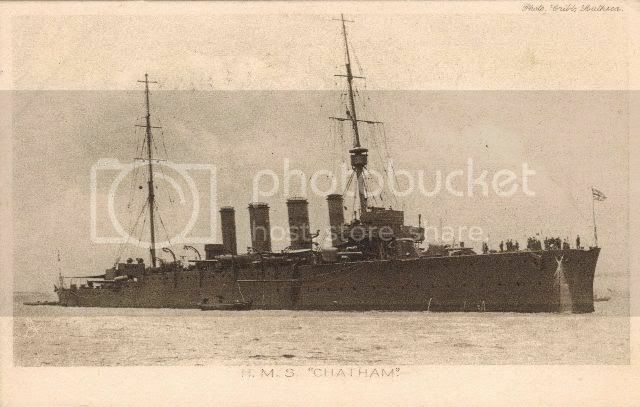 Is anyone aware of photographs available of HMS Chatham during her time in the Dardanelles?